Bhutan visa must be applied for a minimum of 30 days before travel. All visas must be approved by Bhutan Foreign Ministry, from where a clearance number will be issued. A Bhutan Visa Application must be mailed, along with four (4) copies of original passport photographs. The actual visa is stamped on arrival in Bhutan while the visa is cleared in advance, and a visa clearance number issued. For all travelers entering Bhutan by Druk Air, the visa clearance number is forwarded to concerned overseas Druk Air stations and without the Clearance Number passengers are not allowed to board the flight. This Visa Clearance Number is also required while issuing Druk Air tickets. 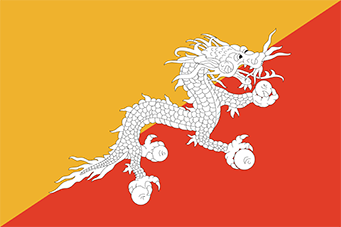 For all travelers entering into the country by surface through Phuntsholing (the border town south of Bhutan), the visa is stamped on arrival and the Clearance Number is forwarded to the Foreign Ministry’s office for references and record. Payable on arrival, in cash.